This week my 5th Graders started taking the new State Test – SBAC. This got me thinking about how I did things this year as opposed to how I did things just a few years ago. At least 1 month of test prep AKA No actual teaching occurs. Bribery – If you come every day you’ll get… (Make ups were grueling). More Bribery – If you are ‘caught’ working hard you’ll get… This ‘helped’ with the ‘I don’t care’ attitude; which was really focused on schools getting money that we desperately needed. 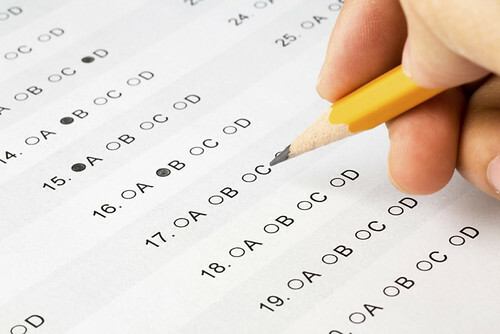 Test Taking Skills – These were drilled during the month long test prep period. Tricks – During the days of the test ‘Here’s a pack of Smarties, cuz you’re so smart’. More Tricks – Chewing gum helps you focus. You get to chew gum during the test! Snacks – Some years, the school provided snacks so kids had food in them to… yup you guessed it, do better on the test. Paper/Pencil – Teachers freaked if a kid erased, and they didn’t do it well enough. The state might think we were cheating or mark it wrong – EEEK! I had a MAJOR case of anxiety one year – full on tears, couldn’t breath, and ‘flappy’ hands. This went on for WEEKS! Me to my principal- Wait, when is the test? The Friday before the test to the class – Oh, by the way, we start State Testing on Monday. My students – Can we chew gum? Can we bring candy? What about…? Me to my Students – I expect you to try your best and work hard. Looking back, I can’t help but wonder how much undo stress our well meaning ‘encouragement’ gave students. THEN, there was a month long build up with the focus on doing well. A student’s efforts or growth was of no interest. The only interest anyone had were the numbers. What percentage of students are Proficient or Advanced? Did we meet AYP? API? All our Subcategories? AHHHHHHHH! Currently, I am happy to report that I haven’t had 1 anxiety attack this year. I am so NOT stressed! I’m a much happier teacher. I think my students are still a bit worried, but I would gather to say that it has more to do with past pressures – flashbacks if you will. I have jumped off the ‘Testing Wheel of Insanity’. I am proud of my students. They all tried their best and took their time. Honestly, I don’t care how they do. I know how far they’ve come this year; and how hard they’ve worked. They are amazing! I’m sure in a few years that some – okay probably many – will choose to go back to the ‘Testing Wheel of Insanity’. I will wave to them and continue doing what I do. I will focus on growth, their perseverance, and efforts. In the long run, those qualities will make them better prepared for the future than an arbitrary stamp of approval by some legislator. I dare you to join me in celebrating something other than a number, and avoid the ‘Testing Wheel of Insanity’.